Built in the devotion of Lord Buddha, Mahaboudha Temple houses around 10,000 Buddha statues. It is often called the “temple of thousand Buddhas”. 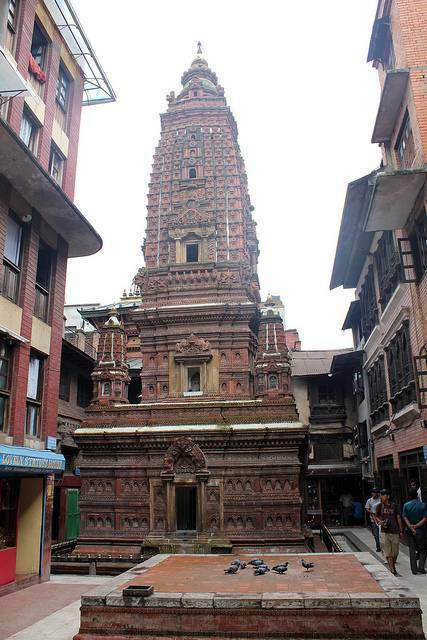 Near to the Uku Bahal monastery, this temple is indeed a masterpiece of the traditional craftsmen of Patan. A peaceful place to visit, you can lit a butter lamp and pray for your well-being. It was built by a priest named Abhaya Raj of Patan who once visited the Mahabodhi temple in Bodhgaya, India and learnt coin making there. When in 1564 he got the permission to begin a royal mint in his courtyard, he began the construction of this temple. But unfortunately he died when only the foundation was constructed. The construction of this temple was completed by his fifth son in 1610 when a goddess appeared before him.